Let's preface this post with an indisputable fact: buying carbon offsets isn't going to solve climate change. No one (outside of the climate denial camp) disputes that avoiding climate catastrophe will require a deep decoupling of the economy and greenhouse gas emissions. But when Forest Trends' Ecosystem Marketplace (EM) surveyed companies that buy carbon offsets, it found that they're using carbon markets to accelerate this deep transformation, rather than to create a green-tinted perpetuation of the status quo. We hear this one all the time, but our research shows something completely different: namely, that those companies that do buy offsets are doing so as part of an overall carbon-management strategy, and they're mostly using offsets to either tackle emissions they can't eliminate internally or to create an internal “price on carbon" that focuses attention on emissions and accelerates reductions. Among businesses tracked in EM's newest report, 88% of voluntary offset buyers and 92% of compliance buyers have formally adopted emissions reduction targets. In 2014, the 314 businesses that engage in offsetting invested more than US$42 billion in emissions reduction activities, surpassing the combined investment of the 1,522 companies who did not engage in offsetting (US$41 billion). In fact, companies that included offsetting in their carbon management strategy typically spend about 10 times more than the typical company that didn't offset. Contrary to the "greenwashing" narrative, it appears as though using offsets is increasingly the hallmark of a company that's leading on climate action rather than bringing up the rear. Ultimately, offsets should be expensive to reflect the true cost of climate change, and companies that internally price carbon often do set their internal prices high to focus attention on the issue, but the average offset on the voluntary market sold for just $3.3/tonne of CO2 equivalent last year. 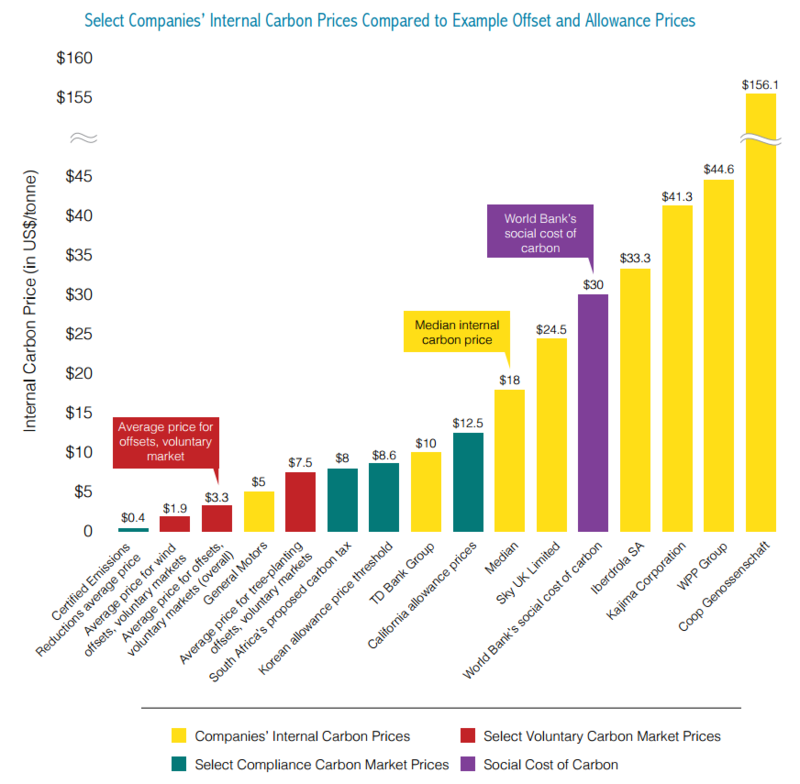 Even when the average price was more than double that value, it still fell significantly under the internal per-tonne price on carbon adopted by many companies: 120 of these businesses reported a median internal price of $18/tonne to CDP last year. Over time, the price of offsets should rise to reflect the cost of dealing with carbon emissions, but that's not an added cost imposed on us randomly; it's an existing cost being properly reflected. For now, however, offsets are cheap - too cheap. This is true for now, but that's a question of policy, and not of product. So far, nearly all governments introduce caps on overall greenhouse gas emissions, and as those caps lower in accordance with the Paris Agreement, the price of allowances (issued by governments to permit emissions up to the level of the national cap) and offsets (created by entities that actively reduce emissions) should rise - unless, of course, emissions drop so far and fast that the problem is resolved. Legitimate carbon offsets come from projects and are rigorously verified by third parties in accordance with recognized carbon standards, and many companies choose to buy from offset-generating projects close to home. 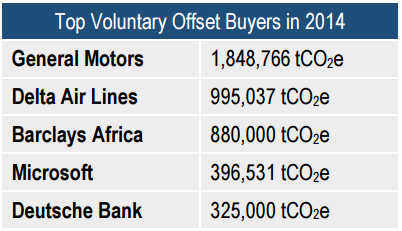 Among voluntary offset transactions reported with geographical details in 2014, about a quarter involved a buyer purchasing offsets from the same location as its corporate headquarters. This practice is especially prevalent in North America, exemplified by the purchasing habits of companies like TD Bank and Waste Management Inc. The EM report speculates that brands buy offsets close to home in order to demonstrate impact to their consumers and bolster their "social license to operate" in a country or region. Unlike the allowances used in cap-and-trade markets, offsets always represent real removals of carbon dioxide from the atmosphere or avoided emissions somewhere in the world, and carbon standards require that developers demonstrate "additionality," which means they have to show that the emission reduction wouldn't have happened without the project. What's more, EM's newest report found that 79 companies are generating offsets within their own operations or supply chains by reducing emissions above and beyond regulatory requirement and economic incentives. L'Oreal, for example, distributes efficient, cleaner-burning stoves to women in Burkina Faso who boil the shea nuts used in its cosmetics products. Those stoves reduce emissions by reducing the need to chop trees, thereby saving forests, and they also reduce the health hazards of indoor smoke. Well, this one might be sort of true, but that's partly because global emission reduction agreements have yet to take effect, and also because offsets are designed to be part of an overall reduction strategy and not a substitute for one. Companies surveyed in the report typically offset less than 2% of their total emissions, usually because they're using offsets to compensate for just one segment of that total, like employee travel or the carbon footprint of a single product. Even the small percentage, however, represents a tangible impact on the climate - the over 140 MtCO2e in offsets reported to CDP in 2014 had the equivalent impact of taking 30 million cars off the road for a year. 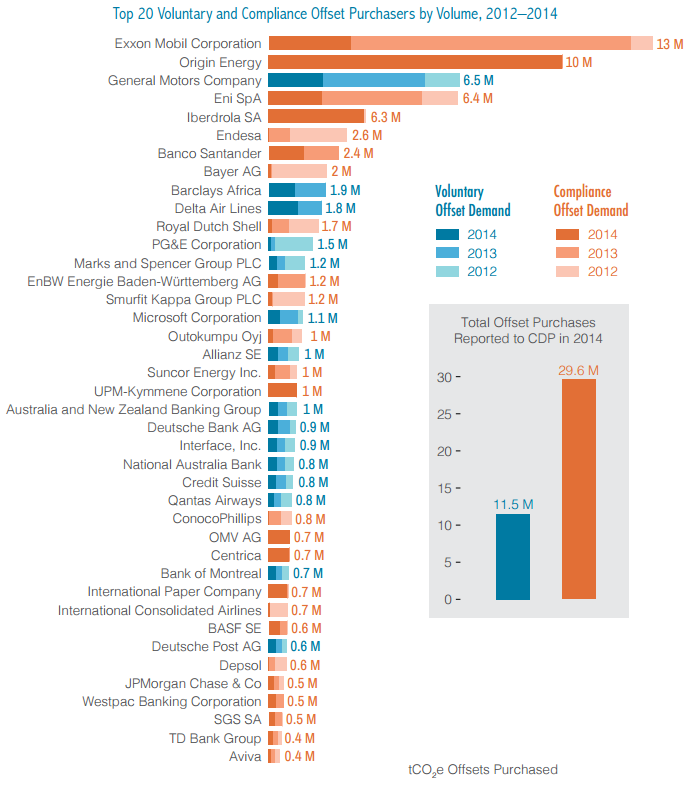 As more companies sign on to the Science Based Targets Initiative, the percentage of emissions they address may go up. So far, the vast majority of companies that offset do so voluntarily, because there's no law telling them they have to. That's already changed in places like California, where companies are using offsets to help meet up to 8% of their emissions reduction obligation under the state's cap-and-trade system, and it will continue to change around the world as emissions trading ramps up under the Paris Agreement. 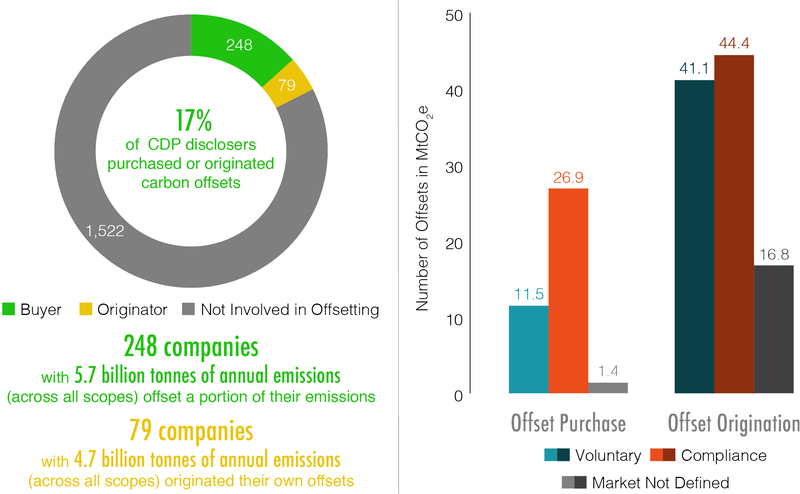 Buyers in these nascent compliance markets disclosing to CDP reported purchasing nearly 27 MtCO2e in offsets in 2014. As industrial emissions drop, project developers are waiting with bated breath to see how things shake out in the aviation sector, where the International Civil Aviation Organization (ICAO) is determining rules for a Market-Based Mechanism (MBM) to help airlines achieve carbon-neutral growth starting in 2020.